This 40 x 40 inch quilt top took me about 4 episodes of “Top of the Lake” to make and came together really easily. I already knew the colours worked together and all the cutting was done I just had to make log cabins. I am really beginning to love what you can do with solids. I struggled with the first quilt with the lack of pattern, but now can not wait to make my next solids quilt. I have a cunning plan already. I think I might, if I’m allowed to say it, like this one more than your sil’s. This one has so much more movement. And how could anyone resist all those pretty blues begging to be log cabins? I am glad someone else understands the pull of those pretty solids… I had to do something with them, I just had too. LOL. I, on the other hand, prefer the pixelated one! But I totally understand the lure of the scrap pile, especially when there’s a useful amount of something. I just found myself reading all of your comments to myself with an English accent (since I don’t know an Australian one well enough to talk to myself in it). It’s time to shut the computer off! But I love your quilt! and I love the improv version we’re making for the Hope group of DGS this month. Isn’t it nice to get distracted into making something every once in a while? I love a good log cabin quilt! And solids… and blues… love, love, love! I love this!! So glad you ignored what you were supposed to be doing and put these little log cabins together! I love this quilt. Blue perfection. Sometimes, a project just has to be done. It is as simple as that. I’m working on one of those right now. She just did a little sneak attack right into my queue and it is the only one I’m interesting in doing at the moment. It happens to all of us! You were really just tidying up as you go by clearing up scraps, which is a very responsible thing to do. 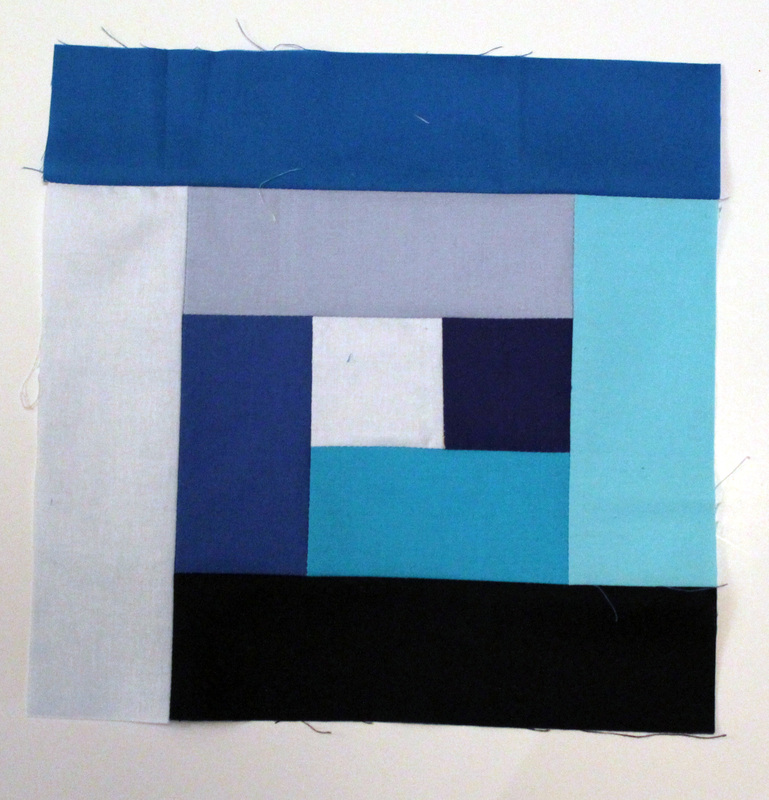 I like the idea of tidying up involving making more quilts. My quilting space is a mess and needs a good tidy. Note quilts will definitely follow this process. That is wonderful. I love solids! It’s looking great! 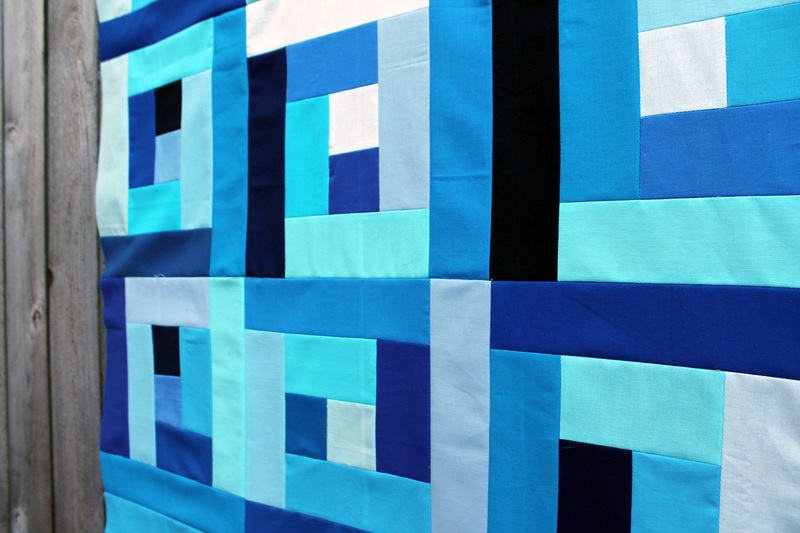 The different shades/values of the blues gives a lovely allover flow of movement. Love it! so beautiful! 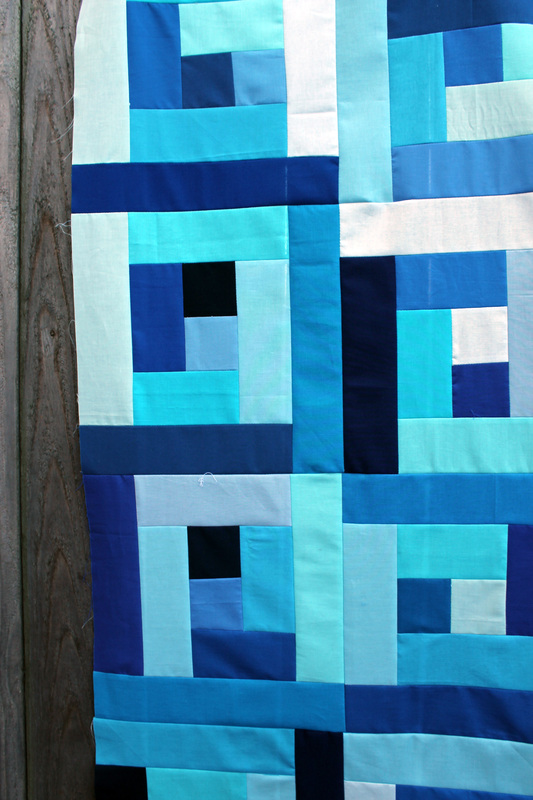 I love working with solids and have been in the mood for a blue quilt! 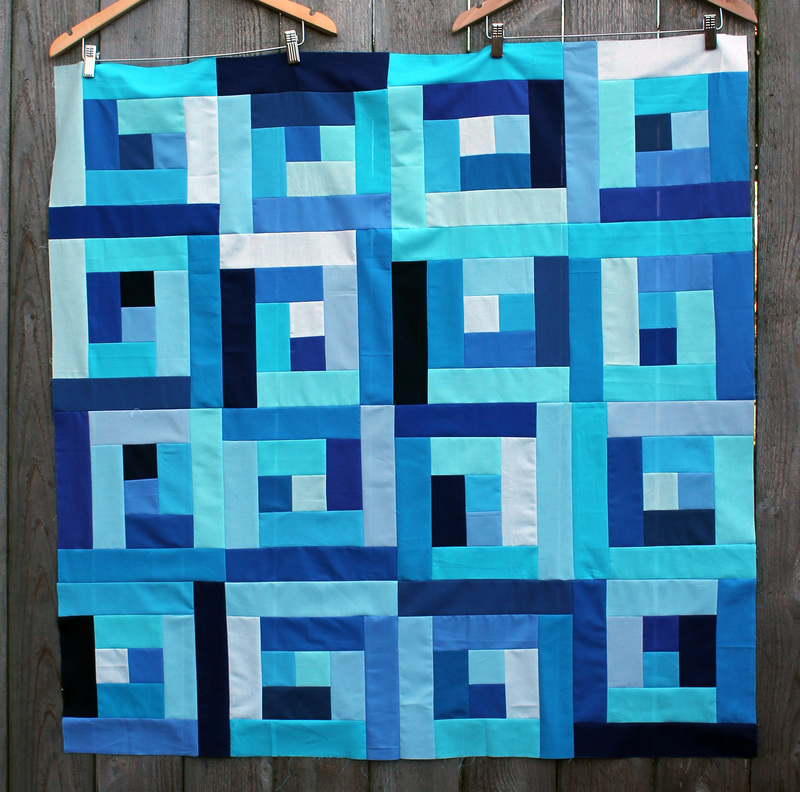 I can highly recommend blue solids after my last two quilts. Some how these blues just work, but I am with you about blue – I do not love it. Beautiful! And you may have talked me into more solid quilts. 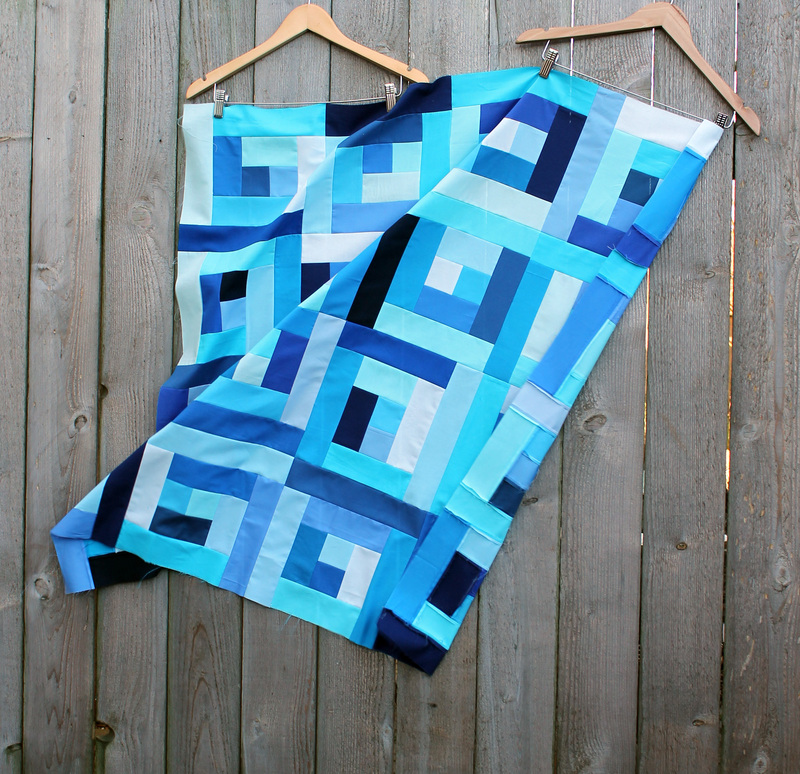 I love the patchwork look with many different fabric prints, but solids have a simplicity that is calming. That is really cool. I too poo poohed solids a while back, but they are sneaking into my brain. “Top of the Lake” ……shall I tell you who did it? ……noooooooooooooo! It is a compelling show and well written and will also sneak into your brain. Oh I finally finished Top of the Lake and I was haunted and frustrated. I knew what was going in half way thru and wanted her to catch up faster. Loved it though and want to go back and watch the last episode again.